I just love my spiralizer . Today I made Sweet Potato Pasta with Brussel Sprouts and Pistachios. This sweet potato pasta is super easy to make. Great for those days when you need to pull something together quickly. The flavors in this dish were inspired by my maple glazed Brussel sprouts. Since sweet potatoes and Brussel sprouts are my favorite vegetables, I had to put them together. 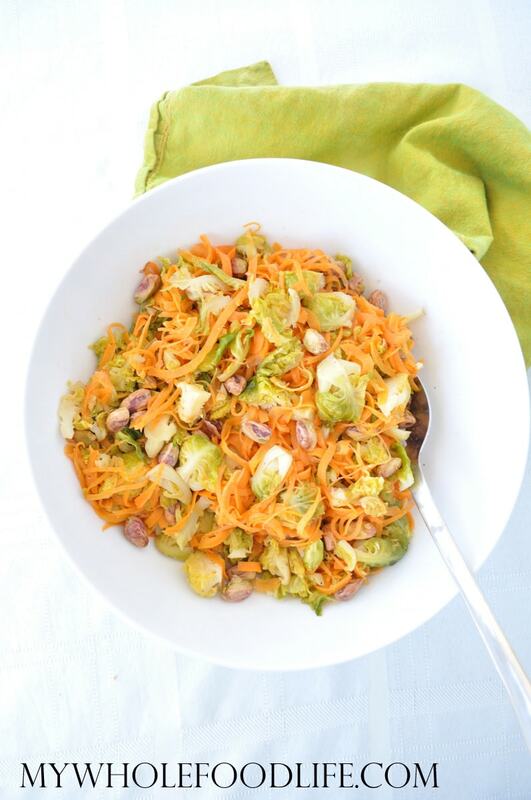 This sweet potato pasta with Brussel sprouts fits almost every diet. It’s vegan, gluten free and paleo. Grain free too. The pistachios add a little crunch as well as some protein. I also think this sweet potato pasta would be great with a cashew cream instead of the maple glaze. I may try that next time. Dried cranberries or even pomegranate would be a nice addition as well. If you needed a nut free version, you can easily use pepitas instead of pistachios. Cut the ends off the Brussel sprouts and quarter them. Add the Brussel sprouts to a large saute pan with the oil and maple syrup. Cook covered on medium to low heat. You may need to add a little extra oil or some water if the oil cooks off. Keep a close eye on them and stir every couple minutes. They should be soft in about 7 minutes or so. Once the Brussel sprouts look soft, add in the sweet potato and sea salt. Stir together for another couple minutes until everything looks softened. Lastly, add the pistachios and mix well. If you wanted to take some of the sweetness out of this dish, you could add some chili powder. I have tried to make your blueberry bliss bars twice now..I made it exactly as stated and it does not ever set up as you say it will. It is always runny even after blending it. Am I doing something wrong or are the ingredients printed wrong? Evidently there are 2 kinds of coconut cream. The creamed coconut I used is actually coconut butter. I have edited the post to talk about that. If yours were made with the cream that is not setting up, stick them in the freezer and they should firm up there. Ohh this looks fantastic and something great to make when looking for a quick dinner! I absolutely love my spiralizer and use it for zucchini all the time, but it's been too long since I've done anything with sweet potatoes! Can't wait to make this! Oh, quick and easy!! And stuff I always have on hand - will definitely be trying this one. I am not sure. I know with zucchini, you can use a peeler, but the potatoes may be too hard for that. Looks great. What brand spiralizer to you have? I've read that some are not strong/sturdy enough for sweet potatoes. Oh yum! I need to bust out my spiralizer this weekend!!! Thank you!! I hope you enjoy the recipe. I really need to get a spiralizer. All the creations look awesome. This looks yummy! What would you substitute for brussel sprouts, as they are not readily available where I live. Also to take some of the sweetness out of this dish, why not just omit the maple syrup? The sweet potatoes are naturally sweet anyway..... For a Middle Eastern flavor you could add some cumin. It goes great with sweet potatoes. I use it all the time when I make roasted sweet potaotoes. I also add a little bit of hot paprika (or chili powder would also work.) Thanx for your great recipes. You can definitely omit the maple syrup. I think spinach might be a great sub for Brussel sprouts. I made this again the other day and added chili powder and smoked paprika. That was good too! Just made this tonight. It was great! I cut the pistachios in half to cut calories (haha, of course I left all the maple syrup--PRIORITIES!). It was DELICIOUS and so easy. I added some chili powder. It kind of scratched that pad thai itch I get sometimes; even though they don't taste alike, it just had that noodley, sweet, nutty thing going on. I really loved it. Thanks so much! You are so welcome Rachel! Glad you liked it.